Stem: (1)2--7(8.5) dm, soft-hairy proximally, generally glabrous distally. Leaf: 3--8(10) cm, broadly oblanceolate to oblong-oblanceolate in outline, pinnately lobed; lateral lobes 2--5 pairs, << terminal lobe; distal generally hastate, simple, narrowly lanceolate to linear. Flower: sepals 3.5--5.5 mm, not horned; petals (6)7--9(10) mm, 2.5--4 mm wide, claw 3--5.5 mm. Fruit: (5)6--10(13) cm, 1--1.5 mm wide, linear; style 1--3(4) mm; pedicel ascending, 3--6 mm, +- as thick as fruit. Seed: (60)80--100(140), 1--1.5 mm, oblong. Chromosomes: 2n=14. 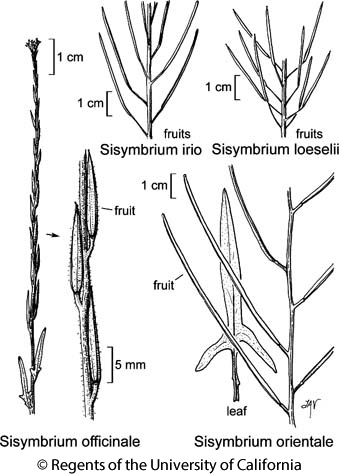 Citation for this treatment: Ihsan A. Al-Shehbaz 2012, Sisymbrium orientale, in Jepson Flora Project (eds.) Jepson eFlora, http://ucjeps.berkeley.edu/eflora/eflora_display.php?tid=44654, accessed on April 19, 2019. GV, CW, SW, DMoj; Markers link to CCH specimen records. Yellow markers indicate records that may provide evidence for eFlora range revision or may have georeferencing or identification issues. Purple markers indicate specimens collected from a garden, greenhouse, or other non-wild location.